What do you expect to get for $1700, $2000, or even $2500? That's a helluva lot of money to dish over to someone for a baby animal. Your answer to that question should be... you should be getting a lot more than what most breeders provide. In most cases, you are sent home with a puppy who has been ripped away from everything it has even known, is terrified, and is now expected to live with you, with no support system from the "breeder". Here's my take... If you pay someone $2000 for a puppy, you should be getting more than just a puppy. Let's be honest... $2000 is a lot of money. It seems like a really obscene price to pay for an animal that isn't trained or even house broken... but what if you get something besides just a puppy in return? Isn't that how it should be? Why is EVERYONE selling puppies for $2000, but only a few breeders are offering support for the lifetime of the pet? That seems insane to me. How did we end up here in society... that paying $2000 to a complete stranger and never getting anything else in return is the norm? It's not right. -Part of the family...You will be part of our extended family from the very beginning. Depending on when the litter is planned and when you contact me, you may be made abreast of the breeding process, the whelping process, and everything in between. You will know the results of the ultra sound and x-ray before puppies are born. -Photos...You will have access to hundreds of photos of each puppy from the very beginning up until the time they go to their new homes. -Gear recommendations...I will make recommendations on equipment (crates, leashes, beds bowls)that you will need to have on hand when you first come home with your puppy, as well as reading material so you are ready when your puppy comes home (breed specific). -Support system...I will be your support system from the time you first contact me, until your puppy is an old dog. You can call me day or night with questions about anything pertaining to your puppy. -Exposure...Your puppy will be exposed to literally hundreds of things, sights, sounds, experiences, and people... before you take him/her home. I want to ensure I give your puppy the best start to life I possibly can, so you have a better chance at succeeding. -Stuff...I will send your puppy home with a go-home bag. It will have puppy exercise recommendations, toys, a blanket, things to chew on, things to read and will be personalized to your puppy. -Visits... at five weeks of age we will begin accepting visitors, with potential owners having priority. You can stay as long as you wish (within reason of course). -Once home... Once you go home with your new puppy the support does not stop. If you have questions about feeding, exercise, training, behavior, health... I am here at your disposal to help. -Health Guarantee... your puppy will be guaranteed to be free of any inherited congenital health anomalies. -Return Clause... Your puppy will go home on a contract that protects you as the buyer and your puppy. If at any time during your pup's life you can no longer care for him/her, the puppy be returned to me. Why do prices fluctuate between breeders? The cost factor is dependent on the local cost of living, the stud dog fee, cost of traveling for reproduction needs, the current price for veterinary care and the cost to whelp a litter. The size of the litter as well as any needed emergency care can also play into price. Also it is important to remember that the larger the litter, the more it costs to feed for 8 weeks before they go to their new homes. If a breeder is doing things the right way, they might break even at around 8 puppies. Meaning, that they basically get the money back they have put into the breeding. This does not include emergencies, but a normal litter that is whelped at home with zero problems until puppies go home at 8-12 weeks. 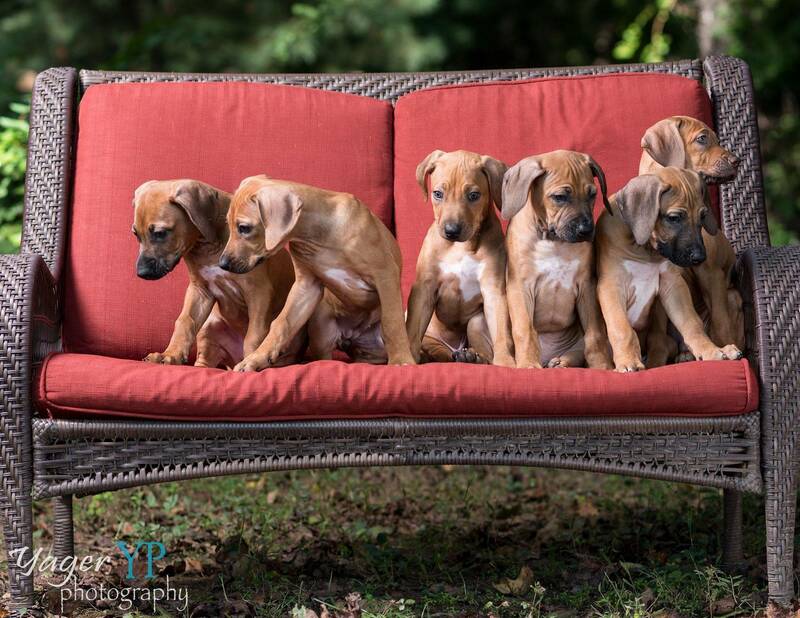 For a Rhodesian Ridgeback puppy from a reputable breeder with health tested, champion parents you can very much expect to pay anywhere from $1700 to well over $3000 for a Ridgeback puppy. A Semper Fidelis Rhodesian Ridgeback puppy will cost between $2000-$2500 depending on many factors. Most reputable breeders price all of their puppies the same whether they are male or female, show, performance or companion quality. They may give a discount for Ridgeless puppies or a puppy who has had a removed dermoid. My theory behind this is that all of my puppies have been raised the exact same way, so there is no need for any particular puppy to cost less or more, than any of the others. When buying from a back-yard breeder you are just paying a high price tag for a low quality puppy from untested dogs. Who's to say in a year the dog doesn't need surgery for hip dysplasia, or begins to show signs of thyroid disease, or becomes deaf. These are the sort of things that reputable breeders try to prevent by completing health testing on their breeding dogs. Remember that the initial cost of the puppy is only a fraction of what you will spend. You will spend over $1000 in food alone just the first year. That doesn't include supplies, training or vet visits. According to some studies it costs around $1500 per year to properly care for a dog (not including emergencies). See below for more information on the difference between reputable/responsible breeders and backyard breeders.